DXA is the gold standard technique used for the management and follow-up of osteoporosis.  3D-SHAPER is a software application that registers a 3D statistical model onto the hip DXA scan of the patient, and uses a model-based algorithm to create a 3D map of the cortical surface density. It allows clinicians to assess the cortical and trabecular macrostructure in 3D from a standard hip DXA scan. A multicenter clinical study was performed to compare 3D-SHAPER with Quantitative Computed Tomography (QCT) analyses. Strong correlations were found between measurements performed using the two techniques . Picture: Cortical thickness distribution (left) and frontal slices showing bone density values (right) obtained by 3D-SHAPER and QCT for three patients . 3D-SHAPER incorporates a statistical model built from a database of quantitative computed tomography scans. The shape and density variations in the first three principal directions are shown . 3D-SHAPER registers the statistical model onto the DXA projection of the patient. The algorithm maximizes the similarity between the projection of the model and the DXA image . 3D-SHAPER estimates the cortical thickness and density by the fitting a mathematical function onto the density profiles measured along the normal vector at each vertex of the femoral shape . Product 3D-SHAPER analyzes the proximal femur in 3D. Clinical cases 3D insightful information in clinical practice. Publications Access the latest publications about 3D-SHAPER. News Stay informed about the news. Galgo develops 3D medical image post-processing software solutions to add predictive value to personalized treatment strategies. Each patient is different and requires tailored treatment: personalized medication, surgical implants and interventional strategies. The increasing availability of high-quality patient images enables Galgo's algorithms and software to extract key clinical information to support clinical decision-making and planning and guidance of interventional procedures. • Intra-cranial aneurysms, to plan, for each patient, the endovascular treatment with braided devices. • Epilepsy, to tailor the implantation of deep electrodes using complex 3D multimodal data. • Arrhythmias, to identify the arrhythmic substrate and to plan catheter ablation procedures from cardiac MRI. • Osteoporosis, to improve disease management by turning DXA images into 3D patient-specific models.